PepsiCo's ill-fated "Moments" spot, featuring model Kendall Jenner, was quickly pulled with an apology. Recent high-profile advertising missteps by Pepsi and skin-care company Nivea underscored anew Madison Avenue's awkward relationship with racial diversity at a time when the United States is becoming less white. 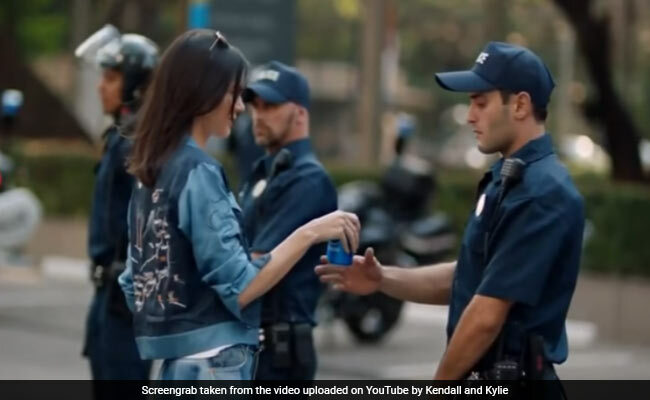 PepsiCo's ill-fated "Moments" spot, featuring model Kendall Jenner, was quickly pulled with an apology after being vilified for trivializing the "Black Lives Matter" movement. Nivea also apologized and withdrew an ad for a deodorant after its "White is Purity" pitch was embraced by white supremacists. Social media had a field day with the botched campaigns, which seemed to suggest scant progress from the white male bubble of the 1960s depicted in the popular television series "Mad Men." "Between Nivea's 'white is purity' ad and Pepsi's 'Black soda matters' ad, I think it's time to open my 'Ask a Black person' consulting firm," comedian Travon Free said on Twitter. In fact, data shows a diversity deficit in a sector that both reflects and molds public sentiment. Only 4.1 percent of advertising industry employees in the country are African Americans, well below their 13.3 percent of the overall population. Latinos account for 12.3 percent of the industry, compared with 17.6 percent of the population. Nearly half of respondents among advertising employees said the industry was "terrible" or "not great" at hiring diverse professionals, with another 25 percent describing it as "mediocre," according to a survey released last September by the American Association of Advertising Agencies. The trade group's outgoing president Nancy Hill made publicly calling out "racist and misogynistic behavior" her New Years resolution for 2017. "I have realized given the current climate in our country and our industry, that doing that privately is tantamount to condoning the behavior," Hill said in a column on a marketing industry website. "Others involved need to know that this industry does not tolerate this kind of thinking and its resulting behavior any longer." Some major advertisers, such as Verizon, General Mills and Hewlett-Packard have threatened to fire firms that aren't diverse enough. The demise of the Pepsi spot has especially provoked intense discussion throughout the industry. The company is led by Indian-born chief executive Indra Nooyi, a vocal proponent of diversity. A poll by PR Week showed 40 percent on respondents blamed the debacle on lack of diversity or diversity of thought, while 25 percent said it reflected an overzealous approach to attracting millennials and 13 percent blaming the fact that it was made by Pepsi's in-house creative team and did not involve an outside firm. The spot follows Jenner as she is stirred from a fashion shoot by a handsome Asian cellist to join an unspecified but peaceful street protest with people of all ethnicities, including African American street dancers. The two-and-a-half minute short film culminates with Jenner handing a Pepsi to a handsome grinning police officer, a move that draws wild applause from the crowd, including from a hijab-wearing photographer who nods in agreement as she records the moment. The spot spurred instant ridicule, most witheringly from Bernice King, who posted a picture of her father, Martin Luther King, being apprehended at a civil rights march by police. "If only Daddy would have known about the power of #Pepsi," King wrote on Twitter. Kelly O'Keefe, a professor of brand strategy at Virginia Commonwealth University, said the spot was shockingly heavyhanded in its constant hawking of cola. It reflected a "cloistered view of the world and distorted view of diversity," he said, adding that the spot has dominated discussion in class this week. Jake Beniflah, executive director of the Center for Multicultural Science, thought the ad was a spoof when he first saw it because of the omnipresence of the product and in its creation of "utopian" world where every race is shown. "Perhaps they thought diversity on camera was enough, but obviously it wasn't," Beniflah said. "In fact, it backfired." For Judy Davis, a marketing professor at Eastern Michigan University, the controversy stirred memories of Barbara Gardner Proctor, one of the women she profiled in her book, "Pioneering African American Women in the Advertising Business: Biographies of MAD Black WOMEN." Proctor was fired in the 1960s from a large firm when she refused to work on a campaign that showed black women clamoring in the street for a hair product. The ad was a tasteless allusion to the civil rights movement, she said. "It was the same kind of trivialization of a serious social movement and taking that to promote some brand," Davis said. "You would think in 2017 things would be different. But here we are seeing some of the same problems that were present 50 years ago, and I think that's pretty amazing."